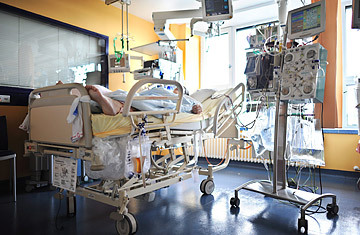 A patient is treated for E. coli in an intensive care unit at the Hanover Medical School in Hanover, Germany, June 21, 2011. Andrea Heinze was a 29-year-old in perfectly good health  until she ate those sprouts. Like hundreds of others in Germany, she had consumed produce contaminated with the E. coli bacteria. Now Heinze knows this summer won't include trips to the swimming pool: not only would people stare at the blue marks on her legs and hips, she's got a catheter in her arm  and there's also the high risk of infection. She won't be going jogging or playing other sports either  she'll be happy if she manages to climb the stairs on her own. Heinze, in fact, is still very, very sick. She has to undergo four hours of dialysis three times a week. Once a week, she needs antibody therapy. Heinze suffers from the hemolytic-uremic syndrome (HUS), caused by the E. coli bacteria. Some 850 others in Germany present the same condition. At least 47 of them have died. While Heinze's situation is no longer life-threatening, her world has been turned upside down. Her body is always at risk due to swellings caused by toxins and her kidney function is severely limited. Although she is back in her own apartment, going back to work as a sales agent is out of the question for now. Her mother has moved in with her part-time. The Asklepios Clinic in Hamburg-Barmbek has become a second home for Heinze. She's there this particular morning, making her way to the third floor in her wheelchair. There she's greeted by Dr. Tobias N. Meyer who takes her to the treatment room where she lies down with a folded towel supporting her head. Meyer, the hospital's lead kidney specialist, attaches the catheter in Heinze's shoulder, and for 30 minutes the liquid from the bag suspended overhead drips into her bloodstream. It contains Soliris. One dose of the drug costs 5,800 euros, making it one of the most expensive medications on the planet. For many HUS patients it's their only hope of one day leading a normal life again. Kidney specialists know the drug well, but it has never been tested or approved for treating an E. coli infection. However, because of the astonishing results in some cases, it is being used on 100 seriously ill HUS and E. coli patients in Germany. "Five outpatients and four patients here in the hospital are presently being treated with Soliris," says Meyer. He adds that the drug, produced by American biotech company Alexion, may prevent or at least alleviate the swellings in the brain and kidneys that HUS causes. Alexion's German subsidiary currently provides the vials free of charge, and began researching other possible uses of the drug. Andrea Heinze is part of that study. She knows that there may be risks, but she just wants her life back; a life that doesn't involve dialysis or the risk of inflammation. She says, to her, the risk is worth it. Heinze first went to the emergency room at the Barmbek Asklepios Clinic on May 20th. She was complaining of serious stomach pains and doctors told her she was infected with E. coli. Not long after, she developed the hemolytic-uremic syndrome, which can lead to severe neurological damage and renal failure. Later, doctors determined her illness had been caused by contaminated sprouts that she had eaten at her favorite restaurant on May 1st. Since, Heinze has avoided raw foods. "Everything I eat is cooked," she says. As the anti-inflammatory antibodies slowly drip into her veins  a process that in itself is not painful  Heinze talks about her illness, and the terrible headaches she suffered. "But it's a lot better now than those first four weeks in intensive care." Back then, she even suffered hallucinations. She only partially remembers what happened. Her parents came to see her twice a day. She was in a lot of pain. And she was very afraid. "I also slept a lot, I was sedated." As Heinze slowly began to feel better, she started watching news reports about the E. coli epidemic on TV. She then knew she was not the only case; there were others at the clinic who had also been infected. After three weeks of lying alone in her room, she was well enough to be wheeled outside. "I met other patients like me, who looked just like me. Green hospital gown, covered head, surgical mask," something she says helped her feel better. Heinze doesn't ask herself why she had to be one of those who ate contaminated sprouts, and now has to receive antibodies and undergo dialysis three times a week. "It was just bad luck, it happened by pure chance," she says. "And I'm glad that I got through those terrible first few weeks." Psychologists call this inner strength resilience, the ability to bounce back when things go wrong. Andrea Heinze hopes that Soliris will work and that one day she'll be able to come off dialysis. Until then, she can't return to work. She may have lost over 13 lb (6 kg) since falling ill, but she hasn't lost her sense of humor. "Talk about a summer diet!" she says with a laugh. The Gambler: Dominique Strauss-Kahn, a Psychological Profile. The Libyan Diaspora and the War. Poland: Tragedies of the Past, Hopes for the Future. See an interview with a food-safety expert on the outbreak. See 10 pivotal food-safety scares.